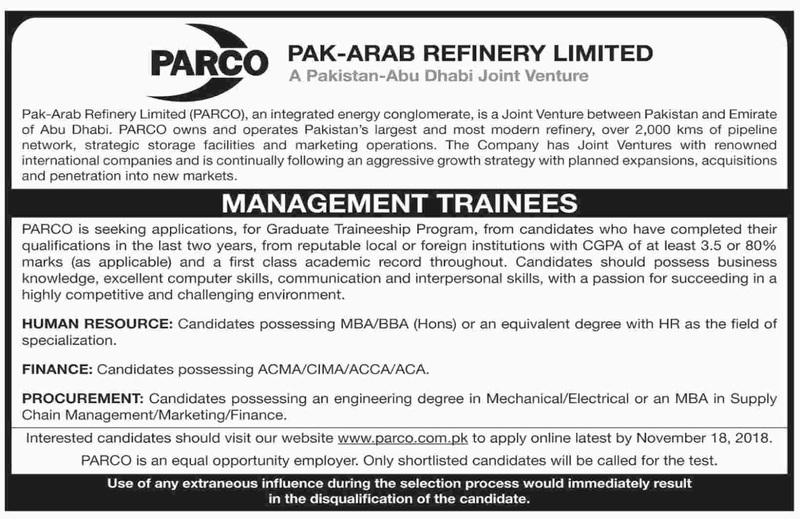 Pak Arab Refinery Limited (PARCO) Karachi Sindh. Pak-Arab Refinery Limited (PARCO), an integrated energy conglomerate, is a Joint Venture between Pakistan and Emirate of Abu Dhabi. PARCO owns and operates Pakistan's largest and most modern refinery, over 2,000 kms of the pipeline network, strategic storage facilities and marketing operations. The Company has Joint Ventures with renowned international companies and is continually following an aggressive growth strategy with planned expansions, acquisitions and penetration into new markets. PARCO is seeking applications, for Graduate Traineeship Program, from candidates who have completed their qualifications in the last two years, from reputable local or foreign institutions with CGPA of at least 3.5 or 80% marks (as applicable) and a first-class academic record throughout. Candidates should possess business-knowledge, excellent computer skills, communication and interpersonal skills, with a passion for succeeding in a highly competitive and challenging environment. Candidates possessing MBA/BBA (Hons) or an equivalent degree with HR as the field of specialization. Candidates possessing an engineering degree in Mechanical/Electrical or an MBA in Supply Chain Management/Marketing/Finance. Minimum Graduate, with specialized security training and certifications, Possessing at least 5 years’ in-depth experience of managing security operations in a large organization having countrywide installations, preferably at remote locations. Preference will be given to Ex-Armed Forces’ officers with the completion of colour service. Interested candidates should visit our website www.parco.com.pk to apply online latest by November 18, 2018. PARCO is an equal opportunity employer. Only shortlisted candidates will be called for the test. Use of any extraneous influence during the selection process would immediately result in the disqualification of the candidate.